Century Concepts International USA Civil War General Robert Edward Lee Framed Photograph With Antique Civil War Battlefield Bullet Item #CC1160. Own a piece of history. Century Concept brings you hard-to-find military, aviation, and historical collectibles and gifts. Wood frame under glass measures 12" x 15" & 8" x 10" photo. 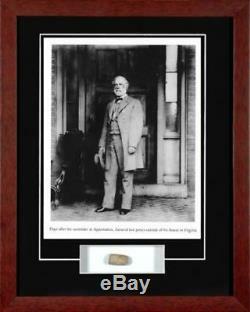 The item "Civil War General Robert E. Lee Framed Photo With Antique Battlefield Bullet Coa" is in sale since Thursday, June 2, 2016. This item is in the category "Collectibles\Militaria\Civil War (1861-65)\Original Period Items\Photographs". The seller is "bordi20" and is located in Jim Thorpe, Pennsylvania. This item can be shipped worldwide.